Now you can use Gapminder World – with all its indicators – from your own computer, even when you have no Internet. 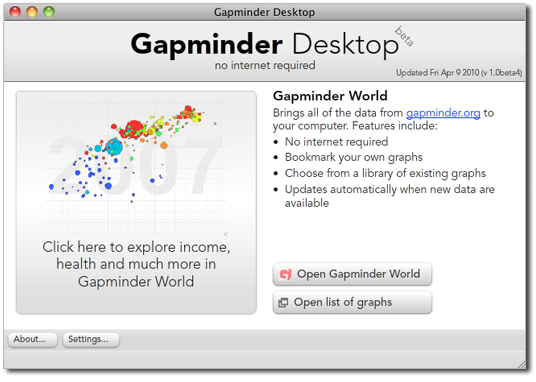 Just download and install the new Gapminder Desktop. A downloadable version of Gapminder World is the single most requested tool, and we are very happy to be able to now offer just that, free of charge. 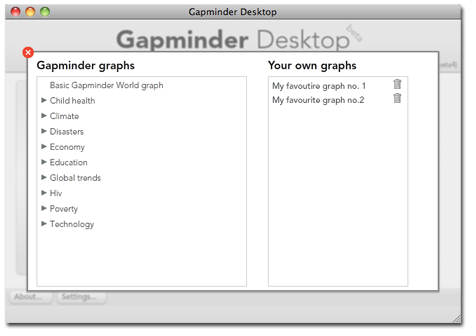 Gapminder Desktop is particularly useful for presentations as it allows you to prepare your graphs in advance and you won’t need an Internet connection at your lecture or presentation. In the “list of graphs” you will get at preset list of graphs on the left side, but you can also very easily create your own favorite examples. Simply arrange the graph the way you want it and click “bookmark this graph”. Your example will the appear in your own list of favorite graphs. Perfect when you want to prepare a lecture or presentation.